Scatter diagram of characters' factor score distributions (Activity and Comforting axes). Recently, local mascot characters called “Yurukyara” have been active in various places. They play an important role in raising a region’s image and exciting the region to promote regional development. It is important to understand the impression given by the characters, since each character’s image leads to the promotion and recognition of the region. In this study, we analyze the impression of local mascot characters to provide useful information for regional promotions, etc. First, we extract the Kansei factors from the characters’ appearances and classify the characters within the factor space. Next, we analyze the differences in impressions when adding character-profile and video information. H. Inoue and Y. Fujisaki, “Impression Space Analysis of Local Mascot Characters for Regional Promotion,” J. Adv. Comput. Intell. Intell. Inform., Vol.22, No.5, pp. 731-737, 2018. K. Osawa and M. Yamada, “Relationship between Impressions and Popularity of Yuru-charas,” Proc. of the 17th Annual Conf. of Japan Society of Kansei Engineering, B21(3pages), 2015 (in Japanese). S. Ito, “Comparing Characteristics and Impressions of Local Mascots,” Tokyo Metropolitan University Psychological Research, Vol.22, pp. 21-30, 2012 (in Japanese). 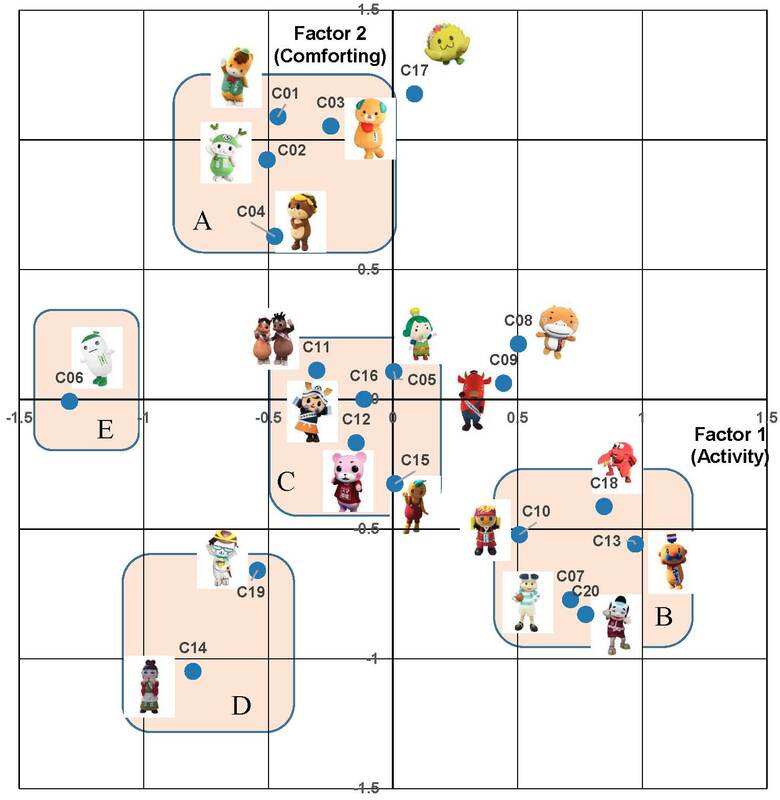 S. Jiyavorananda, H. Ishikawa, S. Sakai, K. Yamanaka, T. Yamanaka, and T. Masuda, “Elucidation of Factors Predicting the Impression of “ıt Yuru-sa” in Japanese Yuru-kyara Mascot Characters,” Int. J. of Affective Engineering, Vol.15, No.3, pp. 231-238, 2016. S. Ito and T. Yamashita, “Applying Rough Set to Analyze Psychological Effect of Mascot Character Design,” Int. J. of Affective Engineering, Vol.13, No.3, pp. 159-165, 2014. M. Hotogi and M. Hagiwara, “Analyses of Local Mascot Characters and Proposal of Automatic Character Creation System Using Affective Words,” Int. J. of Affective Engineering, Vol.14, No.4, pp. 299-307, 2015. C. Tateishi, G. Inou, H. Sawai, E. Koyama, Y. Kitani, and M. Fujito, “The Effects on the Popularities and Interests Mascot Characters’ Acceptability Give to the General Public,” Proc. of 2013 2nd IIAI Int. Conf. on Advanced Applied Informatics, pp. 373-378, 2013. S. Suzuki and Y. Kurata, “An Analysis of Tweets by Local Mascot Characters for Regional Promotions, Called Yuru-Charas, and Their Followers in Japan,” Information and Communication Technologies in Tourism 2017, Springer, pp. 711-724, 2017.